1) an update of the status of bills passed during the regular session. The Governor will be acting on more next week. 2) ICYMI, below the announcement and attached a copy of Governor Scott's letter to school board members and superintendents related to implementation of SB7026 on public/school safety wherein he sets deadlines and expectations. Early this morning the Senate by a 65-32 vote passed the compromise $11.3 Trillion appropriations bill that the House passed early yesterday and President Trump signed the measure this afternoon. His approval ends almost six months and five Continuing Resolutions of the 2017 budget in order to get a spending plan for this current federal year (began last October and ends Sept. 30th--education funding is for our 2018-2019 school year as education is one of those "forward funded." Below, with thanks to Leslie Finnan and our colleagues at AASA who prepared it this morning, is a rundown of the budget for education. (note "m" is million and "b" is billion). Importantly, Elementary and Secondary Education Act (ESEA) programs were not cut and many have slight increases. Of keen interest to Florida districts in particular was Title II dollars for teacher training. The program was not eliminated as recommended by the Administration and first approved by the House. Funding stayed level, however. HR1625 (the 2232-page bill was included in last night's Update) will continue funding for a second year, FY2019 which will be our 2019-2020 school year, with minor adjustments as well. Thus, we will not be going through the budget debate until this time next year, after the November elections and a new Congress is sworn in (116th). The Style and Drafting Committee, after a brief two hour discussion on how to proceed, set April 3rd to come back and begin work on editing, grouping and summarizing the 25 Constitutional Revision Commission proposals passed during this week. Chair Brecht Heuchan asked committee members to provide input to committee staff during the interim. As a possible grouping, former SBE Member and Miami attorney Robert Martinez suggested all but one education issue be grouped under education and the one, eight-year term limits for school board members (proposal 43), be placed in a local government category. Another member suggested elections. No decisions were made. Consensus appeared to be to have as few groupings as possible as Heuchan reminded the committee there are already five amendments on the November ballot. The Commission has until May 10th to complete its work. The House on a 256-167 vote passed a 2232-page amended two-year appropriations bill to HR1625 and sent the measure to the Senate. The roll call vote is here. The text of the bill is here in PDF format and can be searched. The earliest the Senate can consider the bill is Saturday morning (48-hour period). Another 30 hours could be taken by members procedurally to delay approval and who may be opposed to it. Thus, an extension of the current Continuing Resolution, which expires at midnight tomorrow, may be needed. The Constitutional Revision Commission wrapped up its run-through of 103 commissioner-filed proposals today, sending a number to the Style and Drafting Committee for further action, specifically to put into proper order and recommended "packaging" for placement on the November 6, 2018 ballot. The committee meets tomorrow and Friday and possibly additional days as needed. The full Commission then reconvenes for final action and a vote which, at that time, will require 60% or 22 members voting yes. The Commission has an absolute deadline of May 10th to be fully done. Proposal 10 - EDUCATION, Civic literacy in public education; a new section in Article IX of the State Constitution to require the Legislature to provide for the promotion of civic literacy in public education. Proposal 26 - EXECUTIVE, Cabinet; Office of Domestic Security and Counter-Terrorism; county sheriffs; Section 4 of Article IV of the State Constitution to establish the Office of Domestic Security and Counter-Terrorism within the Department of Law Enforcement and to specify the authority and responsibilities of county sheriffs in ensuring public safety and security. Proposal 43 - EDUCATION, School districts; school boards; limitation on member election period; Section 4 of Article IX to establish a limitation on the period for which a person may be elected as a member of a district school board. (eight years starting after November, 2018 general election). Proposal 44 - EDUCATION, State University System; requirements for tuition or fee increase; Section 7 of Article IX of the State Constitution to provide that the Legislature may not raise tuition except through legislation approved by two-thirds of the membership of each house of the legislature and presented to the Governor for approval. Proposal 65 - MISCELLANEOUS, Workplaces without tobacco smoke or vapor; Section 20 of Article X of the State Constitution to establish a general prohibition on the use of vapor-generating electronic devices in enclosed indoor workplaces. Proposal 93 - EDUCATION, School districts; school boards; charter districts; Section 4 of Article IX of the State Constitution to authorize high-performing school districts to become charter districts. (gives statutory “flexibility” for districts operating schools established by the district). Proposal 103 - LEGISLATURE, Sessions of the legislature; Section 3 of Article III of the State Constitution to provide that the Legislature convene for regular session on the second Tuesday after the first Monday in January of each even-numbered year. Other education proposals were either withdrawn, not heard or defeated in committee or "on the floor." Proceedings this week are available for vodcast on www.thefloridachannel.org under "Video Library." As of this hour a purportedly agreed-to two-year budget has not been released. House and Senate Republican and Democrat leadership met this morning on the pending agreement. For K-12 education, We are hearing level funding for ESSA Title 1, continuation of Title II although the funding level is not known exactly, a modest increase in IDEA special education, continuation of Perkins vocational/career education, and something over $2 Billion toward school security including training, security devices and mental health assistance. If something gets released tonight, I'll do a follow-up. Otherwise, we may wake up to the news tomorrow. The fifth Continuing Resolution since September 30th expires at midnight Friday so a further extension is possible in order to allow time for votes. "Governor Scott has made record investments in state funding for K-12 for the past six years and this historic high of $21.1 billion in total funding is an increase of $484.8 million in state and local funds over Fiscal Year 2017-18. · $112.6 million for various education initiatives included in the FEFP, such as transportation and instructional materials." Yesterday, the Governor's office asked the state's new media, who had been reporting on calls for a special session to increase education funding, to include the following: "Your story should note that the Governor's budget proposal for the upcoming year funded the base student allocation at $4,356.40, an increase of $152.45. The Florida Senate's K-12 initial budget proposal funded the base student allocation at $4,158.75, a decrease of $45.20, and the Florida House of Representative's K-12 initial budget proposal funded the base student allocation at $4279.15, an increase of $75.20." School districts supported the Governor's budget proposal throughout the session. The final BSA is $4204.42, a $.47 increase over this year's (October, 2017) calculation or a .01% increase. The total combined state/local dollars per unweighted FTE will increase by a state average of 1.39%. The bulk of the total $484 million K-12 increase is appropriated for additional school resource officers, optional training of (non-regular classroom) employee armed "guardians," and mental health counseling and assistance programs contained in SB7026. Meeting for a little over an hour in extended session, the Florida Legislature approved its 2018-2019 budget and tax package and has adjourned the 2018 regular session at about 4:16pm. The final House vote was 95-12 and Senate 31-5. HB5001, the General Appropriations Act, can be accessed here. sections 1-2 involve public education. HB5003 is the implementing bill and can be accessed here. For convenience, I've attached again the district FEFP run that will serve as the basis for school district budgeting for next year (the Department of Education will issue a second calculation in June/July). By law, the bill links the FEFP run as the official work paper. One section is new on funding compression, starting on line 120 of page 6. The intent is to equalize funding for those districts whose total per FTE was lower than state average in the prior year. The House agreed to the Senate position on this and both put $57.8M into the formula. Also approved was HB7087 that contains the tax package for next year. Included for public schools are: 1) a 3-day tax free holiday for school supplies Aug. 3-5, 2018; 2) includes defining school technology to include assistive devices such as white boards for purchase from capital funds; 3) requires a performance audit to be conducted by OPPAGA for school districts no sooner than 60 days from date of a planned infrastructure sales tax referendum; and 4) increases the cap from $100 to $150/fte districts can use from capital dollars for property/casualty insurance. I'm still in the process of updating the list of bills that passed the 2018 session. Two have been added for indirect classroom implications: HB1055 concerning public records exemption of school identification for children of addictive treatment facilities, and SB1392 that requires consideration of civil citation for juveniles if a similar program is not already in place. The link to HB5001, General Appropriations Bill or GAA, is here. Again, Sections One and Two are pertinent for PreK-university education. Meanwhile, Governor Rick Scott this afternoon signed SB4 on higher education into law that expands the value of Bright Futures scholarships toward their original values and allows use under circumstances for summer programs. The Governor also signed HB7055 into law at the same time. For your information is the presser released following his approval. As you are aware, the bill has parts of over 25 bills in content and covers more than the scholarships listed below. 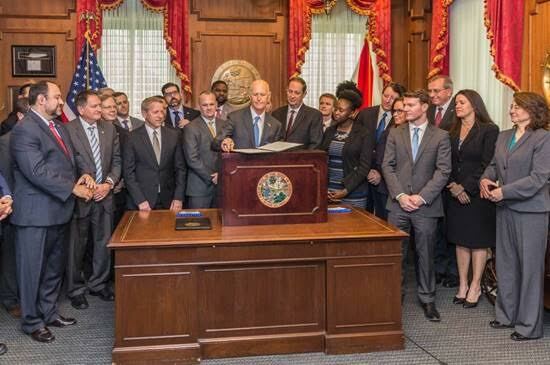 TALLAHASSEE, Fla. - Today, Governor Rick Scott signed HB 7055, which increases scholarship opportunities and expands school choice in Florida's K-12 education system. Since taking office, Governor Scott has focused on ensuring Florida's children receive a quality education by championing increased funding for Florida's K-12 public schools, and strongly supported school choice by signing legislation that provides more flexibility for students and families. Governor Scott said, "Every child in Florida should have the opportunity to get a great education at the school of their choice so they can achieve their dreams. I am proud to sign this legislation today and I appreciate the work of House Speaker Corcoran to put the needs of our students first. Speaker Corcoran has been laser-focused on making sure that every child in Florida can get a great education and I appreciate his efforts to champion this legislation for our students. This bill, along with the efforts we have made over the past seven years to support Florida's schools, teachers and students, will help ensure Florida's children have the opportunities and resources they need to succeed in the classroom and beyond." · Establishing the Hope Scholarship Program for students who are victims of bullying, harassment, and violence. To view the transmittal letter, click HERE. ​The House and Senate adjourned their floor sessions late last night and will meet in extended session tomorrow at 3pm to vote on he budget conference reports for HB5001(General Appropriations Act), HB5003(Implementing Bill) and HB7087(tax package). No other bills are slated for consideration. Both chambers held relative short debates on the budget before ending their floor session. A common concern on the education budget was a $.47/FTE increase in the Base Student Allocation (BSA), which was attributed in part by budget leaders for the need to provide a $97M increase in safe schools and $69M in mental health assistance. Links to the budget documents were sent Thursday night. The current status of HB7087 on tax cuts is attached. It is a Senate "delete everything amendment. It includes a 3-day tax free holiday for back to school, a cap increase from $100 to $150/fte for districts to use local capital dollars for property and casualty insurance and a requirement that a performance audit be conducted by OPPAGA at least 60 days prior to a infrastructure tax referendum. This bill is still amendable, unless the two budget bills which require either a yes or no vote. Attached is a preliminary XLS file of bills that have passed the Legislature this session that have a direct or indirect effect on Prek-12 education. As we spend the weekend go further into yesterday's actions, this may be adjusted in days to come. Right now, I wanted to get a draft in your hands. Below is the complete press release by Gov. Scott's signing of SB7026 on public safety. He signed the bill and issued this release almost immediately after meeting with family members of the shooting victims at Margory Stoneman Douglas High on February 14th. TALLAHASSEE, Fla. - Following a meeting with the families of victims of the shooting at Marjory Stoneman Douglas High School, Governor Rick Scott today signed SB 7026, the Marjory Stoneman Douglas High School Public Safety Act. This legislation makes significant reforms to make Florida schools safer, while keeping firearms out of the hands of mentally ill and dangerous individuals. To view the Governor's major action plan, which was announced on February 23rd, click HERE. Governor Scott's full remarks as prepared for delivery upon the signing of SB 7026 are available HERE. Creates a three-day waiting period for all firearms sales. This does not apply to law enforcement officers, correctional officers, active duty military members or members of the Florida National Guard or United States Reserve Forces who are purchasing a rifle or shotgun. The waiting period does not apply to the purchase of a rifle or shotgun for those who have completed a hunter safety course and possess a hunter safety identification card, or anyone who is exempt from the hunter safety course requirements and holds a valid Florida hunting license. Provides $28 million to expand mental health service teams statewide to serve youth and young adults with early or serious mental illness by providing counseling, crisis management and other critical mental health services. The conference Report on the 2018-2019 state budget was clocked in at 1:40 this afternoon, starting the 72 wait period before lawmakers can vote on HB5001, the General Appropriations Act. While early in the day the word was for the House and Senate to extend to Monday, the decision was made later to go into extended session and debate/vote on the budget conference reports on Sunday afternoon. The House is set to convene at 3pm Sunday. As of this hour, the Senate has not set a time. Here is the Conference Report on HB5001/General Appropriations Act (GAA). It contains appropriations by line item and accompanying proviso—look at sections 1-2. Here is the much sought after FEFP Report that contains the full run by district. The summary page appears first giving the overview followed by detail by county. Last, linked here is the Conference Report on HB5003/Implementing Bill that, by law, links the FEFP run as the official work paper. One section is new on funding compression, starting on line 120 of page 6. The intent is to equalize funding for those districts whose total per FTE was lower than state average in the prior year. The House agreed to the Senate position on this and both put $57.8M into the formula. As you will note, Safe Schools received a $97.5M increase for resource officers and $69.2M for the new mental health assistance category Of concern is a 47-cent per pupil increase in the Base Student Allocation upon which school districts rely for regular school operations including teacher salaries. That amount is up from a proposed $45/FTE reduction by the Senate last month. Both chambers agreed this year to use new construction growth in the tax roll for Required Local Effort. Reassessments of existing property are still exempt from the calculation. Referring back to HB7055 that passed earlier this week, several sections of the GAA (HB5001) are tied to HB7055, intentionally initially by the House. This was the move last year concerning HB7069 and the Senate budget bill, SB2500. Meanwhile, bills are passing, mini-trains keep popping up. Below is a list of bills I'm tracking that have passed the full Legislature and have or will head to the Governor for his action. Please note that HB7021, HB7023, HB7025 and HB7027 are "reviser's bills" which remove obsolete statutes. These bills will be of interest to the legal office. We'll update this list tomorrow night. Click on the bill for a link to our bill-tracking service for details, or go to www.myfloridahouse.gov or www.flsenate.gov. Speaker Richard Corcoran announced tonight the budget will not be ready in time for Friday's adjournment and to be prepared for overtime ranging from an extension to Saturday or special session starting next Monday. New reports have listed healthcare, Medicaid payments for hospital reimbursements and other issues, as the sticking point. Budget leaders say education is essentially done, but no public offers have been released and, thus, Prek-12 funding remains pending. Meanwhile, The House spent most of the day taking up SB7026 on public safety. After two hours of questioning, the chamber took up 40 amendments, going on record in voting them down by party line votes, roughly 71-74 to 41-42. At this point, the bill remains as passed by the Senate yesterday and as distributed to you last night. The house is slated to take it up again tomorrow for debate and a final vote. If no amendments are added and it is approved, the bill will go to Governor Scott for action (sign, let become law without signature or veto). Scott today continued his campaign for his proposal which includes more school resource officers and no armed educator marshals or guards. Attached is his plan and also attached, thanks to one of our FELL members, Eva Regueira, is a working draft summary by section of SB7026 as it currently is written. I don't expect to see a final legislative analysis until final action occurs on the bill. Also rolled to third reading in the House for final vote are the accompanying public records and exemptions bills, SB7024 and SB1940. Also attached is a copy of the enrolled ("ER") version of HB7055 and an unofficial analysis of HB7055 provided courtesy of FELL member Beth Sweeney. The summary should be used as a guide, but is not the official legislative summary for which we are still waiting. Several bills have now passed and are either on their way to the Governor, such as SB4 on higher education, or awaiting signoff by the presiding officers for formal submission to the Governor. They are listed at the close of this email. Full background available at www.myfloridahouse.gov or www.flsenate.gov. Supermajority Vote for State Taxes or Fees: Proposes amendment to State Constitution to prohibit a state tax or fee from being imposed or raised except through legislation approved by two-thirds of each house of legislature; requires a state tax or fee imposed or raised to be contained in separate bill that contains no other subject. Andrea, Michelle and group: On SB7026 in the Senate, Sen. Rene Garcia filed an amendment that passed which exempts only teachers as defined in the first paragraph of s.1012.01(2)(a}, F.S. Sen. Gary Farmer came back with a second amendment that would have exempted all instructional personnel from the now "Feis Guardian Program." His amendment failed on the floor in a voice vote even though bill sponsor Bill Galvano endorsed it. Instead The bill quickly went to the House and we had no chance to get any support to file Farmer's amendment in the House. The program does remain voluntary, however, all the way through from Sheriff to school district to employee. Let's keep this for monitoring during the year and possible amendment next year, presuming the House gives final passage and the Governor signs the bill. Budget - Conferees did not hold any public meetings today, meaning they will need to meet during the first half of tomorrow if a budget is to posted before midnight and a vote can be taken Friday (72-hour waiting period) before the midnight "Sine Die" adjournment. Informal -back-and-forth discussions have been occurring to settle outstanding issues including healthcare, higher education, Prek-12 education and one issue in economic development. Passage of SB4 below hastens settlement on higher education funding. Should the House tomorrow pass or move close to passing the Senate version of SB7026 on public (school) safety, that would allow for the go-ahead on Prek-12 budgeting where most of $400 million is at stake. The Senate voted 31-6 and the House voted 96-16 to approve and send to the Governor HB1279 on school district auditing and fiscal reporting. While the measure did not change significantly from its original version, an amendment by Senate Sponsor Kelly Stargel makes the bill effective in 2019. Stargel explained that districts will be occupied implementing the sections of the school/public safety legislation next year and felt a year's delay to take effect was merited. The Bill as passed is attached in its "engrossed" format. A final "er" or enrolled version should be out tomorrow and I'll forward that to you. The House and Senate have passed SB4 on higher education. The bill, among other factors, increases the value of Bright Futures scholarships, revises membership, scope of responsibilities and standards for universities. The bill was amended to create the “Campus Free Expression Act,” establishing definitions and codifying right to free-speech activities. The act (subject of HB909) prohibits public institutions of higher education to designate any area of campus as a free-speech zone, but authorizes restrictions under specified conditions. It does not include the legislation to split out community colleges from the state board of education. The final "er" enrolled version is attached that will go the Governor Scott for his review and action. As final official staff analyses come on out these bills, I will forward those as well. The bills, amendments, committee staff analyses, history and votes are available at either www.flsenate.gov or www.myfloridahouse.gov. The Senate had scheduled three hours, but spent over 8 hours on 62 amendments and questions related to SB7026 on safety. The delete-all amendment by Sen. Bill Galvano that I forwarded last night was approved with three amendments. One, sponsored by Sens. Bill Montford and Renee Garcia, exempts the increased costs of making schools more secure from the calculation of the capital cost per student station cap. The amendment is attached. A second approved amendment adds 12 hours training time for school marshals in a nationally certified diversity program. The engrossed bill was just posted and it is also attached. It will be on the Senate floor calendar Monday for debate and vote (and likely more amendments will be filed, but require a 2/3 vote for consideration). Also approved and rolled to third reading is SB7024 on public records. It, also, is attached. The 58 amendments to the Galvano amendment that were not approved covered topics from strengthening or loosening gun control provisions to deletion of the Marshal plan to background checks and one that would have allowed a parent to opt their child out of a class taught by a person with a concealed weapon. Most were defeated by voice vote. Those "on the board" were defeated along party lines, often 15-23. The bill history and amendments can be accessed here. Presuming the bills are approved Monday, they will go to the House for action on Tuesday. Time for full concurrence and final passage is tight with the March 9th adjournment looming, now. ​Nearly all of the Prek-12 education budget got bumped today to House and Senate appropriations chairs. After three offers and counteroffers at the subcommittee level, it was determined there are still too many expenditures outstanding that depend on bills, such as the $400M safe schools package, capital outlay funds connected with HB7055, etc. The last offer by the Senate that includes an FEFP summary sheet and outline of issues in proviso and implementing bills is attached for your review. . Finance staff can use both today's Senate FEFP sheet and last night's House page as an idea where we may be headed for most categorical programs and the Base Student Allocation BSA). While House Chair Carlos Trujillo and Senate Chair Rob Bradley will meet over the weekend on other issues, it is unlikely we'll see any major education talks until Monday as SB7026 and HB7055 get closer to resolution. A procedure used last year with HB7069, not invoked per se yet here, is to include the money in the two bills separate from the General Appropriations Act (GAA). That is how Best and Brightest scholarships and the Schools of Hope were funded last year. Doing so would allow FEFP issues to move along, and the HB7055 and SB7026 issues not be restricted to a 72-hour waiting period. The Senate convenes tomorrow for a very rare Saturday floor session to take up SB7026 on school safety. Senate President Joe Negron called the session in order to get the bill heard, questioned, go through a lengthy series of amendments and have it ready for debate and vote on Monday. Negron noted the House rules allow only for bills in messages from next Wednesday on so he wanted to get the legislation in play in time for hopeful resolution and final passage by next Friday's adjournment. This bill has gone through multiple iterations. Late today yet another DE ("Delete Everything") was filed by sponsor Bill Galvano and is attached here for your review (and following in case you wish to watch the session on the Florida Channel). Also attached are two amendments by Sen. Bill Montford that would give school districts flexibility in accessing funds for school resource officers. The new DE is similar to previous versions. The main difference over the course of the past few days is the option of a "Marshal Plan" for training and hiring of school district personnel has been at the option of both the county sheriff and the school district. Today in a press briefing, Negron said he'd had discussions with Gov. Scott to limit the volunteer or employee to non-teaching positions. As of this hour, 19 amendments have been filed and more are on the way. Many focus on limiting the sale of weapons. Meanwhile, the Senate went through an extensive series of amendments on its version of HB7055. The "engrossed" copy, containing amendments approved today, was moved to third reading for debate and vote on Monday. It, also, just came online and is attached. The bill includes many issues including the Hope (bullying) scholarship, instructional reading scholarship, changes to requirements for the low 300 elementary schools in reading including allowing the extra hour of instruction during the school day, a compromise position on restoring some flexibility to districts on Title 1 expenditures, funding charter school capital outlay for FY19 from state, not local tax dollars, changes to charter school applications and non-renewals, clarification of SREF requirements for school districts, broadening the pilot Autonomous Principal program to more schools, reinserting the requirement that unions (applying only to teacher unions at this point) must recertify with PERC if they fall below 50% membership, and other provisions. The Senate version is more alike to the House bill that passed last month. Trade-off is the House has agreed to take most of what the Senate has been seeking for higher education. For us in education, attention is currently focused on two issues: FY19 budget and safe schools. House Ed Approps Chair Manny Diaz early this evening presented the House offer #1 to the Senate on Prek-12 funding. Attached are the three House documents that including funding, implementation issues and so-called "back of the budget" items. There was very little discussion and Senate Ed Approps Chair Kathleen Passidomo said they would get back to the House in "due course." Tomorrow noon is the deadline for subcommittees to reach agreement before unresolved issues get "bumped" to the full committee chairs for 48 hours. The House offer shows a slight increase in the Base Student Allocation over current year compared to the Senate reduction of $5/fte. The House is higher in Safe Schools, but below the Senate on the mental health initiative. Late today another "Delete Everything" (DE) amendment was filed by Sen. Bill Galvano to SB7026. This version, attached, incorporates specified funding amounts (starting in Section 36. It maintains the "marshal plan" but makes it voluntary. Most other sections are similar to earlier versions. Of note were comments by incoming House Speaker Jose Oliva, who is handling the House version (HB7101, 7103 and 7105) that the House will wait to receive a passed Senate bill before acting further. There was also an unprecedented move by Gov. Scott to appear before both chambers today urging support of his $500M plan he released last week. That puts the issue well into next week for final resolution. SB7026 will be explained, questioned and up for amendment tomorrow in the Senate and readied for third reading and a vote to pass it Monday. Meanwhile, a new Senate version of HB7055 was filed late today as well. The "DE" is essentially the same bill as before. It is attached for your review. There are numerous amendments that have been filed to it for consideration tomorrow. Actual debate and vote will likely occur Monday. And...Senate Appropriations holds a three hour meeting tomorrow to conclude its list of bills for this session and both chambers spend much of the day in session as we get into the last week of bills passing each chamber. I'll have an updated list of bills in play during the weekend.